While we lack the bully pulpit and gravitas of a departing president, we would like to issue a similar warning about our society’s changing relationship with financial services. We ask you to reread Eisenhower’s passage above, substituting “financial” wherever you see a reference to “military.” It would start, “This conjunction of an immense financial establishment and a large finance industry is new in the American experience. The total influence—economic, political, even spiritual—is felt in every city, every State house, every office of the Federal government…” And so on. Is this overstating matters? Consider that the financial services industry spent over $5 billion on campaign contributions and lobbyists in the decade leading up to the financial crisis, that by 2007, nearly 3,000 lobbyists represented the industry in Washington, and that the cost of bailout, stimulus, TARP and other recent programs stands at over $3 trillion. 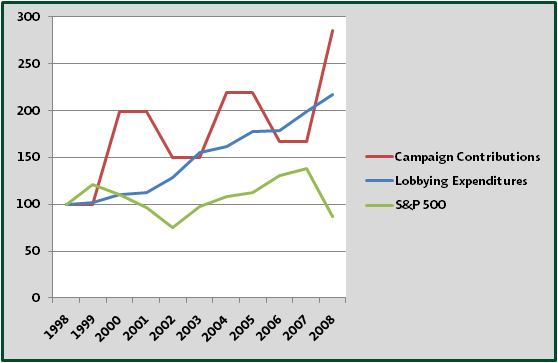 From 1998-2008, campaign contributions from the financial sector rose by 185% to $443 million while lobby expenditures grew by 117% to $455 million. Meanwhile, the Standard and Poor 500 fell by 13%. It is important for all Americans to acknowledge that the political contributions and policy missteps (deliberate or well-intentioned) occurred under both Democratic and Republican leadership reflecting the near-even split in political contributions from banks, securities firms and insurance companies. (See: “Sold Out” http://www.wallstreetwatch.org/) This is not one party’s problem. People could give in to cynicism, chuckle at the irony of financial reform being named after Barney Frank and Chris Dodd, stare in amazement at political candidates who claim to represent the “regular folks” yet are funded by those who exploit their ignorance of finance, shake their heads when government officials promote annuity sales as the basis for retirement planning, and marvel that so little has changed structurally in how investments are crafted, regulated and sold. But that would be a weak response, a concession not worthy of those who are aware of these problems and can potentially influence their successful resolution. While the question deserves a more comprehensive review of cultural, regulatory, and operational changes, there are some low-hanging fruit that are ripe for the picking that do not necessarily require Washington’s acquiescence. · Create much clearer and more restrictive policies regarding how past and present senior officers and directors of major banks, broker-dealers, and insurers can serve in positions of authority or influence at the Federal Reserve Bank, in the US Department of the Treasury, the OCC, FDIC, SEC, and other regulatory agencies or offices, state or federal. Obviously, these policies would need to flow both ways. The argument that their “talent” is invaluable has been sufficiently disproven by those who have crossed over previously and failed massively in their economic judgment if not their political adroitness. If enough voters express enough frustration when conflicted appointments are made, fewer will be made. · Stem the consolidation of financial power in a few financial institutions that have become increasingly dependent on government largess to support their operations. Antitrust or banking regulators could carry this out; in the meantime, consumers decide where to conduct business. · Support community banks and credit unions that are imbedded in the local community, are more likely to return profits to the community, support FDIC, and are of a more human scale. · Eliminate the conflicted relationships between broker-dealers and money managers that materially increase costs to investors in a manner that lacks transparency. Rather than waiting for the SEC to take action, consumers can refuse to do business with conflicted professionals. · Create a fiduciary standard for anyone involved in the manufacture, promotion, or distribution of financial products. That is, require that every financial professional in the supply chain of investment product creation and distribution demonstrates the highest ethical standards and always prioritizes the loyalty and care due to the end client, be it a retired couple, a pension plan, or a municipality. This does not mean that every investment must work perfectly, but that every investment product must be crafted and marketed with the intent of benefitting the end investor—even insurance products. We demand similar accountability in most other industries; finance is largely exempt. · Reward politicians who refuse to accept money from financial corporations that do business in manner that is conflicted with the best interests of their customers. Eisenhower’s words of warning resonated and surprised because he had tremendous credibility when it came to military matters. He was an insider. He had seen the evolution of the US military from 1941 to 1961 and—right or wrong—he did not like what he saw. Financial Services lacks such a powerful figurehead. There is no one voice that can stand up in Washington DC with the credibility of an Eisenhower to warn against the corruption of finance and government. Because of that vacuum, it becomes all the more important that citizens, consumers, and voters of all persuasions express their sentiment in their actions to the best degree they can.